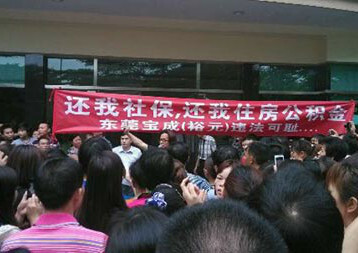 Recently, the city of Dongguan in the Pearlriver-delta saw the biggest strike of migrant workers so far. As many as 50,000 workers took part in the strike at Yue Yuen ((裕元) shoe factories. Owned by the Taiwanese Pou Chen Group, Yue Yuen is one of the biggest contract manufacturers in the world for shoes. Its factories in China, Indonesia, and Vietnam produce for all big brands like Adidas, Nike, or Reebok. The strike in the Yue-Yuen-factories in Dongguan started when workers found out that the company had not paid the full contributions into the obligatory social insurance fund for years, resulting in low pension payments. Other reasons included the low wages (around 2,200 to 2,800 RMB for line workers, including overtime and bonuses) and a general dissatisfaction with the work stress. The majority of line workers are women, many with a few years of work experience in the company. After a few hundred workers had blocked a bridge in protest on April 5, the Yue Yuen management did not react. As a result, thousands of workers went on strike on April 14. A demonstration on the same day was attacked by the cops, and workers were arrested. The strike spread to other Yue-Yuen-factories in Donguan in the following days and later to one in Jiangxi province. The official union ACFTU intervened and tried to stop the strike. Yue Yuen made some promises, including a 230-RMB-living allowance and the payment of the full social insurance contributions, but the strike continued. On April 24, the company increased the pressure, with the support of the police which stationed troops inside the factories. A worker said: "What can you do if a man with shield, baton and helmet is standing next to you?" By April 28, most workers had returned to work. Before the strike, Yue Yuen had already shifted production to inland provinces or outside China in reaction to rising labor costs on the Chinese east coast, and during the strike Adidas moved orders to other suppliers – another case of the increasing relocation of low-profit-industries out of the region. For the workers, this strike was another example for the difficulties they are facing (repression, anti-strike efforts of the police/state, the union, the employers), but it also showed the increasing ability of workers in the industrial zones of China to organize and fight back. As a worker said after the strike: "In the early stage of the strike, workers even hoped the government could help mediate in the dispute but they saw the government's true colors when the union's intervention intensified the suppression. They are the hatchet men and running dogs of the employer. The fire was put out but the embers remain and it will ignite again. And in the next strike we will definitely be better organized and combat-ready!" Thanks for writing up. It would be good to have that interview up on libcom, if someone has time to post it up. This is a very important strike, since it spread beyond just the one factory and covered several under the same ownership. It is also testimony to the rising power of the Chinese working class, since wages wouldn't be rising in coastal provinces unless immigration into large coastal cities was slowing down. Rising wages on the Chinese coast presage rising wages in the rest of China, because the Chnese countryside is running out of under-employed peasants. At some point, not too far off, the workers of China will find themselves winning far more of their struggles. They will then begin to build their organisation more broadly. They will found independent, democratic trade unions, they will fight their way through to legal status, they will overthrow their dictatorship and they'll win big wage rises all round. What makes the coming Chinese uprising so important is that China is effectively the end of the line. Previous episodes of Asian countries which have industrialised, only to face a massive wave of rebellion by a new working class, have been followed by capital moving to somewhere else in search of cheaper labour. From South Korea they moved to Indonesia and from Indonesia they moved to China. A crucial point in this sequence, and one that is often missed, is that each time capital has to search for a new source of cheap labour, it needs to find a larger one. This is because the primary function of a workforce of new workers recently recruited from the countryside is to undermine the economic leverage of the existing workforce. As time goes on, however, the existing workforce grows larger and thus, to keep the same amount of downward pressure on wages, an ever larger wave of under-employed peasants has to be found and brought into the cities. China, however, is the largest pool in the world. The exhaustion of the under-employed labour pool in China is made even more important by the fact that the same process is underway in India - though India is 10-15 years behind in its development. Other Asian countries are considerably smaller and some of them even have higher wages than China already. The ones that have cheaper labour are nowhere near large enough to undercut the new leverage of the working class in China. Further, wages are already higher in Latin America, while Africa is split into 40-50 countries and has a massive infrastructure shortage, thus ensuring that the entire under-employed workforce of Africa won't be thrown onto the global labour market at once. What does all this add up to? It means that the tide is turning. Capital reacted to the insurgent working class movement of the 1960s and early 70s by instituting the globalisation of the production process. Modern telecommunications and developments in transport like shipping containers led to capitalists being able for the first time to take advantage of the massive wage differentials between the advanced countries and the Third World. Ever since then, our labour movements have been on the back foot. China, however, is so large that it effectively sets a floor under wages globally, so rising wages in China reduce the economic leverage that capital has in the advanced countries. When the workers of China rise, workers around the world will be able to fight back against decades of attacks. And the bosses won't know what hit them. salaires encore plus bas. En Ethiopie, à 50-60 euros par mois, ils y sont jusqu’à dix fois moins élevés qu’en Chine, et plus faibles qu’au Kenya, au Lesotho, au Ghana ou au Rwanda. wages even lower. Ethiopia, from 50 to 60 euros per month, they are up to ten times lower than in China, and lower than in Kenya, Lesotho, Ghana and Rwanda. Yes, capital will continue to seek out new sources of cheap labour. I was not saying it wouldn't. My point is that numbers count. Every time capital has to move to a new country in order to escape the pressure of the working class it has created, it needs to find a larger workforce of under-employed peasants (or, in the case of Africa, urban poor). This process has reached its logical endpoint in China. From now on, capital can only find smaller workforces than the one it is escaping. As I said above, while Africa as a whole has a workforce sufficiently large to make an impact on the economic leverage of the vast new working class in China, it won't all be thrown onto the world market at once. Infrastructure shortages and the division of the continent into 40 or 50 different countries mean that globalisation will hit Africa in fits and starts and that the numbers of new workers being introduced to the global labour market at any one time won't be enough to undermine the floor that China will set on the price of labour. These countries will find their wages rapidly rising to China's level. This means that the tide is turning and we will find our side can go on the offensive again.